THE tendency at the present time in airplane building is toward constantly increasing size. It is probably realized by all who have concerned themselves with aircraft that the larger machines are not very far in the future. From the earliest Wright airplane, which weighed approximately 1/2 ton, to the present record holder, the DOX, which weighed fifty tons, took a period of some 26 years. The 10,000 ton airplane, projected on a like time-scale, would, therefore, make its appearance not later than the year 1952. However, with the nature of the present-day technique, it is quite possible, at this moment, that the 10,000 ton plane will be here much sooner. It is already becoming apparent that ideas of the ordinary ocean liners are more and more embodied in airplane construction; and in all probability this tendency will be followed in years to come. 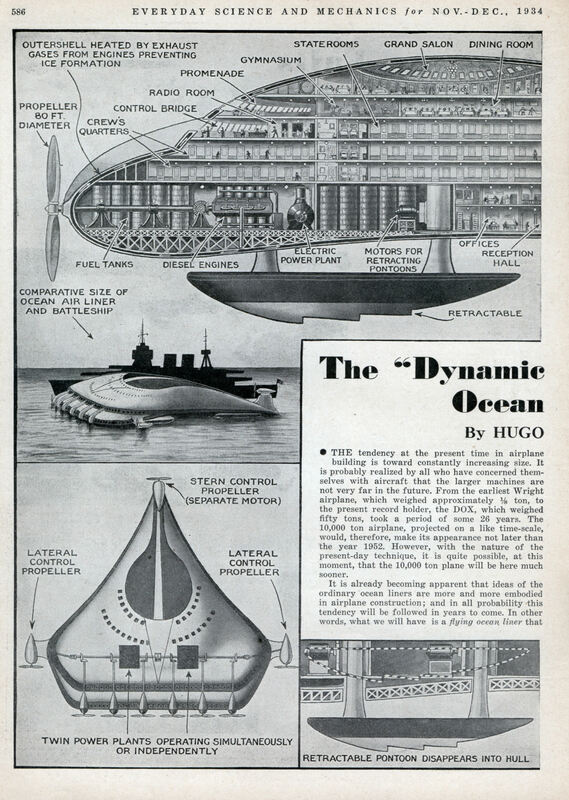 In other words, what we will have is a flying ocean liner that is not only airworthy, but is seaworthy as well. It is also a foregone conclusion that when a 10,000-ton aircraft is built, it will not be a land-type plane but for obvious reasons will have to land in water. This makes the landing and taking off much easier and more practical; because it would be most difficult to take off with, or land, a 10,000-ton weight on terra firma. The question may be raised, why such a large craft? The same principle that holds good for large ocean liners holds good for large airplanes. In the first place, in order to make it as economical as possible, the craft must carry a sufficient amount of freight and passengers, and it must also be sufficiently speedy; and, if past history is a teacher, it will be found that higher and higher transatlantic speeds are needed. The new French express steamer, Normandie, will make the Atlantic crossing from Cherbourg to New York in less than four days. The aircraft of the future, in order to compete at all, must make it in less than a day. This calls for high speed, and safety as well, which can only be accomplished by great speed. We will have a sort of flying wing, from six to seven hundred feet wide, and as long, or longer. It may be roughly triangular in shape. In order to do away with all possible wind resistances, the aircraft must be streamlined as much as possible. 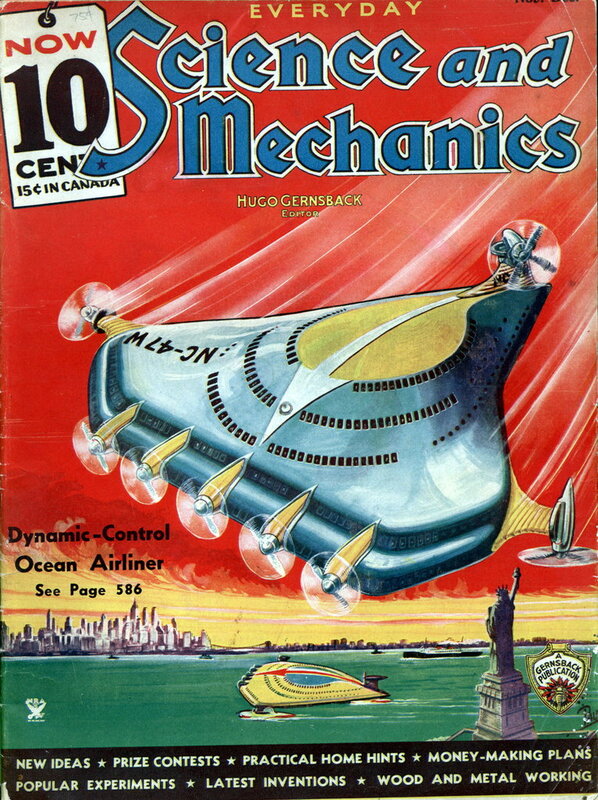 In the November, 1932 issue of Everyday Science and Mechanics, I presented a gigantic flying liner, which had two huge pontoons to support the upper structure. Liners of this kind are under construction this very minute, although not of the very large size which I visualized in 1932, yet we are getting there gradually. There is one disadvantage with this type, however, and that is the two pontoons offer a tremendous air resistance. In the design which I present herewith, I still use the pontoons; but I have made them retractable; so that, as soon as the airplane has taken off, they will be pulled into the body of the airliner, where they will no longer offer air resistance. This is accomplished by pneumatic-hydraulic action when the machine has to land in water.